G5 Airport Antenna. Extends the range of your airport card in the G5 tower. Really is required unless your G5 is sitting on the router. Our $54.77 includes domestic shipping. The Dynamode BT-USB-M1 Bluetooth v2.0+EDR Class 1 adapter features a USB 2.0 interface and features a tiny Bluetooth transceiver that isn't much larger than the connector itself! With such a tiny connector, you can leave it plugged in so you don't break it or lose it. It provides you with Bluetooth v2.0 support with Enhanced Data Rate (EDR) of up to 3 Mb/s and provides Class 1 operating range of over 300 feet. Requires and open USB port and OSX 10.4 and above (Headgap Tested). Our $14.77 price includes domestic shipping. Boost your wireless coverage! 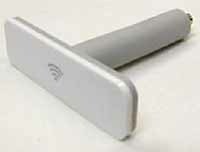 This 9 dBi Omni-Directional Wi-Fi Indoor Antenna is designed for wireless 802.11b/g devices and improves signal strength and signal quality! With 2.4 GHz frequency, you can get a wireless range of up to 350-meters (1148-feet). They can also be added to your router in place of the little pigtails to extend its range. Compliant with AP/Router with Standard RP SMA connector. Do not order this antenna if you do not have an external connector on your system. The SMA connector looks like a TV coax connector but is smaller. 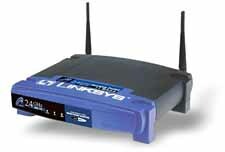 Linksys routers have a larger connector and will not use this antenna. Our $16.77 price includes shipping. 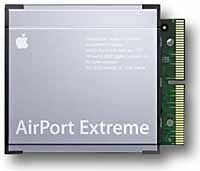 Thoroughly cleaned and tested Apple Airport Extreme Wireless Card 802.11G. FITS: Mac Mini, All Aluminum PowerBook G4s, All iBook G4 laptops (up to mid 2004), All PowerMac G5s(up to late 2005), Power Mac G4 (FW 800), (Mirrored Drive Door 2003), (Mirrored Drive Doors), eMac (2005), (ATI Graphics), (USB 2.0), iMac (17-inch Flat Panel, 1GHz), (USB 2.0), iMac G5 (17-inch), (20-inch). REQUIRES: Requires Mac OS X 10.2.7 or later. Printed instructions supplied for your model on request. Our $49.77 price includes domestic shipping.